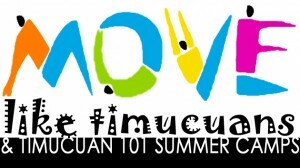 July 9th through July13th, the AIMH welcomed 13 kids, ages 6-10 to its Move like a Timucuan summer program. Throughout the week, they learned about the lifestyle of the Timucuas, the different crops they would have grown, and how they would have collected the rest of their food. The children worked on several art projects including making baskets, creating feather mask, and sewing pouches in which they could store items for safe keeping. They also had an opportunity to visit the Atlantic Seafood Bait & Tackle shop where they learned about the various kinds of seafood caught in the area. Allan Hallman from The Florida Fish and Wildlife commission came out with a trailer full of specimens of local animals. The kids had a great time making their own molds of animal tracks from the actual footprints of Florida wildlife, including a wild hog, coyote, bobcat, wild turkey, Florida black bear, whitetail deer, fox, and Florida panther. The week was a great success, and was enjoyed by the participants and volunteers alike. We can’t wait until next summer! The AIMH’s Da Vinci Backpack Summer Camp wrapped up last week after a fun-filled 5 days of learning about, and creating art. The camp consisted of seven 4th-6th graders, who spent the week working in different mediums from pencils and water colors, to charcoal, pastels and acrylic pants. The students visited Atlantic Seafood Bait & Tackle shop where they learned about the local seafood, and were able to pick out their own subjects for fish printing - generously donated by the shop. They also visited local art shops where they were exposed to the work local artists. On the final day, the students held an art show where they presented their work to friends and family. Our Move Like a Timucuan camp begins on July 9th. Reserve your spots now!